Skeptics is a question and answer site for applying scientific skepticism. It's built and run by you as part of the Stack Exchange network of Q&A sites. With your help, we're working together to build a library of detailed answers challenging unreferenced notable claims, pseudoscience and biased results. If you are familiar with Stack Exchange, but a new user on Skeptics.SE, we have an exhaustive introduction for you on meta, otherwise read on. Are sharks a threat to undersea cables? Slate published an article recently, titled The Global Internet Is Being Attacked by Sharks, Google Confirms. Despite being catchy and all, most of the references seem to be other news outlets or actually contradict the claim. Are there any sources supporting or contradicting that sharks are a threat to undersea cables? Below are points of evidence supporting the fact that sharks are a threat to undersea cables. 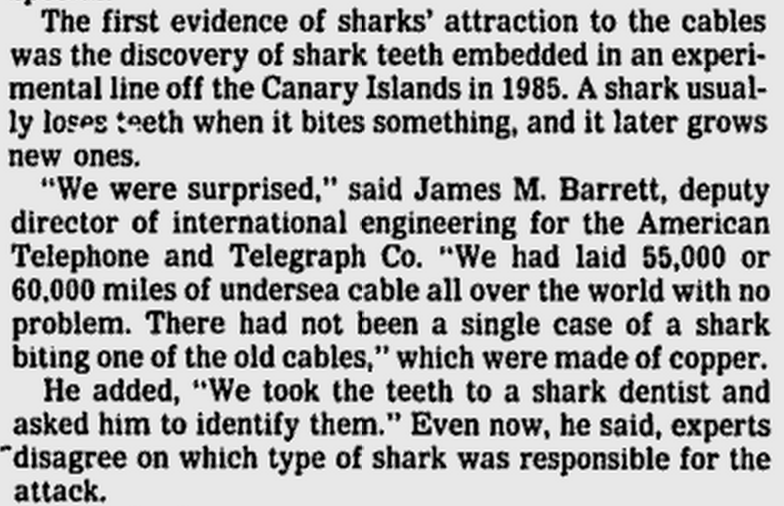 EVIDENCE 1: The first report of sharks attacking cables came from the Canary Islands in 1985, when sharks' teeth were found embedded in an experimental cable. I found the report in an old news paper. Fish, including sharks, have a long history of biting cables as identified from teeth embedded in cable sheathings. Barracuda, shallow- and deep-water sharks and others have been identified as causes of cable failure. Bites tend to penetrate the cable insulation, allowing the power conductor to ground with seawater. Attacks on telegraph cables took place mainly on the continental shelf and continued into the coaxial era until 1964. Thereafter, attacks occurred at greater depths, presumably in response to the burial of coaxial and fibre- optic cables on the shelf and slope. Coaxial and fibre-optic cables have attracted the attention of sharks and other fish. The best-documented case comes from the Canary Islands, where the first deep-ocean fibre-optic cable failed on four occasions as a result of shark attacks in water depths of 1,060–1,900 m [3,478 to 6,234 feet]. EVIDENCE 2: A famous report by New York Times back in 1987 reported that the fibre optic cables linking the US, Europe and Japan were being nibbled persistently by sharks, causing phone and computer failures around the world. In the report The finding that sharks are supersensitive to electrical signals, able to detect electric fields as faint as a few millionths of a volt per centimeter in water, is a recent significant discovery in marine science, Dr. Nelson said. The sharks may detect a faint field near the cable and attack. "Not knowing any better, they try to eat it," Dr. Nelson said. "It's programmed in their genes. Whether the field comes from a cable or from a tin can, sharks are prone to behave as if they were encountering a food item, and try to eat it up." It seems that the funniest battle now is not Google vs. Amazon or Google vs. Microsoft, but Google vs. Sharks. Based on the comments made by Dan Belcher, a product manager on Google's cloud team, during the opening keynote of the company's Cloud Roadshow in Boston last week; Google invests heavily in protecting its trans-continental infrastructure, including wrapping cables in Kevlar to thwart attacks by hungry sharks. 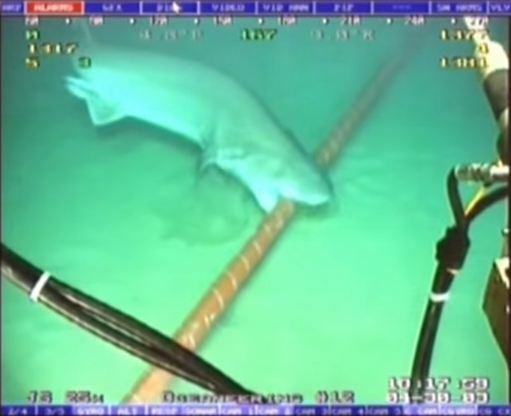 BONUS: A YouTube video showing a shark biting a submarine cable during a survey operation. It was spotted by a remotely operated underwater vehicle. .
UPDATE: The cause isn't clear why Sharks bite cables. Reasons for the attacks are uncertain, but sharks may be encouraged by electro magnetic fields from a suspended cable strumming in currents. However, when tested at sea and in the laboratory, no clear link between attacks, electromagnetic fields and strumming could be established. This lack of correlation may reflect differences between the behaviour of the deep-water sharks responsible for the bites and that of the shallow-water species used in the experiments. Whatever the cause, cables have been redesigned to improve their protection against fish biting. 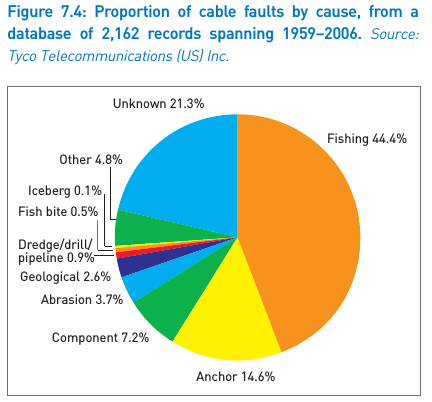 According to Submarine cables and the oceans: connecting the world report, external human aggression causes more faults for cables more than any other category, with fishing accounting for nearly half of all reported faults. Anchoring is the second major cause of faults, with dredging, drilling, seabed abrasion and earthquakes also causing significant numbers. However, natural hazards including seabed abrasion, shark bites account for less than 10 per cent of all faults. Shark bites account for only 0.5% for all faults. They're consider a threat, but it's a minor threat. Sharks are an extremely small threat to undersea cable in regards to others causes as shown in the graphic below (from a report cited in @georgechalhoub's answer). Geological causes damage cables more frequently than sharks' bites. Sharks' bites are only 5 times more frequent than iceberg damage. 14 fish bites (all species) in the last 50-60 years. Submarine cables and the oceans: connecting the world's report (see report cited in @georgechalhoub's answer). Research-level science, discussions of skepticism as a philosophy or movement, rants or personal speculation.